Diego Rossi scored two goals and Los Angeles FC tied the Vancouver Whitecaps 2-2 on Sunday to set an MLS record for points in an inaugural season with 57 and eliminate the Whitecaps from playoff contention. The Vancouver Whitecaps have been eliminated from playoff contention. Diego Rossi scored two goals and Los Angeles FC tied the Whitecaps 2-2 on Sunday to set an MLS record for points in an inaugural season with 57. Los Angeles (16-8-9) is level with second-place FC Dallas, two points behind Sporting Kansas City. LAFC plays at Kansas City on Sunday to end the regular season. Vancouver (12-13-8), sitting five points back of sixth-place Real Salt Lake, will miss the post-season. 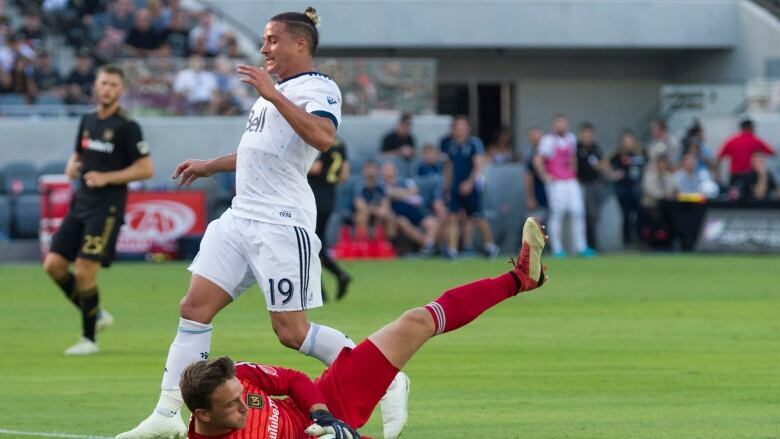 Whitecaps manager Craig Dalrymple said he was proud of his club's effort in tying up the game after LAFC jumped ahead by two goals after 15 minutes. "On another day, maybe another one goes in so we can end up winning that game. But they believed, they never stopped believing," he said. "Even at two-nil [it would've been] very, very easy, most teams would probably crumble at that time, away from home and playoff hopes are dimming, but they didn't so credit to them. Rossi opened the scoring in the fifth minute and he added his 12th goal of the season 10 minutes later for a 2-0 lead. The first goal came on a give-and-go with Carlos Vela, and the second was after a deflected cross fell to his feet at the far post. Yordy Reyna pulled Vancouver to 2-1 in the 22nd minute on a penalty kick and Jordon Mutch tied it in the 65th with a strike from distance. The Whitecaps will wrap up their season on Oct. 28 when they welcome the Portland Timbers. Dalrymple said he expects his club to show well despite the fact that their playoff hopes have been snuffed out. "I think we've gotten better with every game. We've had a win and a tie on the road in four games, played [Sporting Kansas City] 70 minutes very good at home Wednesday, we've got a home game to finish," he said. "The boys will finish strong. They promised me five strong performances and they've given us four and I'm sure they will deliver the fifth."